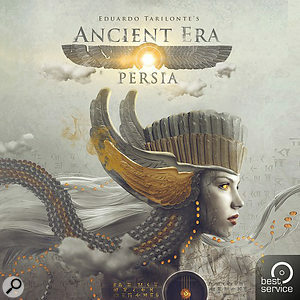 Eduardo Tarilonte is fast becoming the go-to developer of sample libraries exploring unusual ethnic and period instruments; his previous releases include Epic World, Forest Kingdom, Desert Winds and ERA II Medieval Legends. Ancient Era Persia (henceforth AEP) focuses on the Middle East, expanding on Tarilonte’s earlier Desert Winds collection, and includes all four of the wind instruments contained in that library. Like the previously mentioned libraries, AEP runs in Best Service’s (free) Engine player, and features a total of 28 instruments: eight wind, three bowed stringed, nine plucked stringed, and eight types of percussion. All pitched instruments are deeply sampled with legato, varying dynamics and multiple articulations including sampled ornaments, trills, glissandi and more. AEP’s Percussion instruments are rich and varied, covering a wide range of hits, dynamics and pitches. The Davul provides the low-end heft, whilst the Bendhir and Daf are pitched slightly higher. The Tombak, Dayre and Darbuka sit more in the mid-range, with two Riq variations providing high-end detail. Where appropriate, some include short MIDI ‘macros’ assigned to a separate key range, for inserting rolls and fills that might otherwise be time-consuming to program. In the Winds section, the Armenian Duduk, Persian Ney, Turkish Ney and Zourna from Desert Winds are joined by the Kaval, Turkish Clarinet, Turkish Mey and a dedicated patch of breathing noises, the latter comprising 20 different intakes of breath and their equivalent exhalations, adding further realism to exposed wind-instrument passages. These wind instruments are highly evocative, with many expressive stylistic variations possible through various combinations of keyswitched articulations, velocities and MIDI CC control. The Armenian Duduk excels here — the speed of the (real) vibrato can even be changed smoothly over time with a MIDI CC, thanks to Engine’s time-stretching algorithm. Strings are subdivided into Bowed and Plucked categories. The three bowed instruments have distinctly different flavours: Lyra I is the softest, whilst Lyra II is quite resonant, perhaps played on the bridge, sounding not unlike the Chinese Erhu — both have a pronounced rosin noise. The Turkish Violin is more lively and energetic, and could easily pass muster as an Irish folk fiddle, especially with either the A or D drone engaged. Plucked Strings offer plenty of colourful variation, from the low, dark tones of the Oud to the bright, hammered Santoor. The Dutar sounds very similar to a Sitar, even throwing some Sitar-style glissandi for good measure. Tremolo speed, vibrato speed, fret noise, board noise and pick noise controls are provided for most of the nine instruments, the options varying according to the instrument in question. One nice touch on both the high and low Baglamas is the inclusion of three tempo-sync’ed rhythms, playable in any key. These are great for evoking a flavour of Bacchanalian debauchery! Whilst the pitched instruments default to standard Western tuning, there is also a choice of 52 micro-tunings for those needing the ultimate touch of authenticity, providing Arabic, Chinese, Historic, Thai seven-tone and Turkish variations. In addition to the playable Percussion instruments, there’s a huge collection of pre-recorded audio loops at predetermined tempos (ie. not tempo-sync’ed), in both compound and odd time signatures; the Darbuka loops even include 10/8, 11/8 and 13/8! These load as patches, with a different loop on each key. The documentation claims around 1000 loops in total, so there’s plenty of opportunity to mix and match, and keep things changing on the fly. However, if loops of predetermined tempo don’t suit your style of working, there’s some good news. Since receiving the review copy, a version 1.1 update has been released, adding 800 MIDI loops specifically for the percussion instruments. Rather than the usual dragging and dropping into your DAW approach, these loops load as playable patches, with the loops assigned to different keys, allowing for spontaneous, tempo-sync’ed, real-time performances. I had great fun running several of these looped instruments in parallel, producing vibrant, ever-changing and authentic-sounding rhythm parts that I’d have struggled to have come up with myself. There’s also a huge collection of pre-recorded instrument phrases, not necessarily played to a tempo, which complement atemporal, atmospheric passages very well, and which can stand being pushed right to the front of a mix due to their being real performances. And as if that weren’t enough to be going on with, the Soundscapes folder contains 50 moody and highly usable textures to use as pads, drones or backdrops. There are some programming anomalies: to pick a couple of examples, the Duduk’s Expression knob doesn’t work, and the Turkish Ney’s vibrato speed control has no effect, despite both being described in the manual. Also, many of the knobs and buttons that the manual documents as being responsive to MIDI CCs are not actually assigned at all. You can, of course, assign them yourself with the usual MIDI Learn method, but it’s a little annoying nonetheless. Hopefully these programming glitches will be hunted down and corrected in an update. As for existing owners of Desert Winds, they needn’t feel left out: an upgrade path to AEP is available. For an extra £135$159 you’ll get 24 additional instruments plus all the soundscapes, audio phrases and MIDI percussion loops. One of the (strangely likeable) characteristics of Tarilonte’s libraries is that they have what could perhaps be called a ‘rough edge’. They’re not super-smooth and predictable in the way they play, in the sense that there are occasional bumps, clunks and inconsistencies. Articulations can vary in character from note to note, or a particular legato transition might jar somewhat, but despite that, these instruments have a feeling of being alive and slightly ‘wild’. This is an inspiring collection of fascinating and evocative instruments, whether you’re into creating a Middle Eastern mood for films or gaming, or interested in cross-fertilising with other musical genres.